An a.c generator makes use of electromagnetic induction to convert mechanical energy into useful electrical energy. Magnet To provide a magnetic field. Slip Rings To transfer the alternating induced current in the coil to the external circuit. Note that it is not to reverse the direction of induced current every half a revolution. Carbon Brush To make good electrical contact with the external and internal circuits. Coil The coil cuts the magnetic field of the magnets as it rotates and thus induced current flows. As the coil is rotating clockwise, when coil is horizontal, by Fleming’s Right Hand Rule, the induced current will flow in the direction of ABCD in the coil and exit from Q to external circuit and then back to internal circuit at P.
When coil rotates 90° (at vertical position), no current induced in the coil. When coil rotates 180° (again at horizontal position), by Fleming’s Right Hand Rule, the induced current will flow in the direction of DCBA in the coil and exit from P to external circuit and then back to internal circuit at Q. Note that the direction of induced current reverses its direction every half a cycle. When coil rotates 270° (at vertical position), no current induced in the coil. When coil rotates 360°, it backs to its starting position. To have an overall picture on how an a.c generator work, you might want to look at the simulation here. Unlike d.c motor, the shorter wire AB is always in contact with Slip Ring P while longer wire CD is always in contact with Slip Ring Q during rotation. 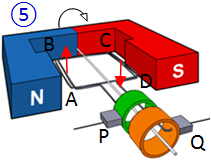 For position 1 and 5, Slip Ring P is negative while Q is positive. However, for position 3, Slip Ring P is positive while Q is negative. a.c generator works as a power supply. For position 1 and 5, by Fleming’s Right Hand Rule, induced current flows out from Slip Ring Q and back to coil from Ring P. Since current flows out from positive terminal to negative terminal, the Slip Ring Q must be positive. Likewise for position 3, Ring P must be positive. Note that the graph is a sine graph or cosine graph depends on the starting position. When the coil starts from ﻿vertical position﻿, it is a ﻿sine﻿ graph. Note that first three factors only affect the magnitude of induced emf while frequency of rotation affects both the magnitude and frequency of induced emf. Both have carbon brushes, magnets, copper coil, and rotating shaft. Both involve energy conversion from one form to another. Instead of fixing the magnet and rotating the coil in a simple a.c generator, a fixed coil generator is made by fixing the coil and rotating the magnet. A bicycle dynamo is an example of this as shown below. As the connection between carbon brushes and slip rings would become loose when carbon brushes wear and tear, this increases the resistance and hence the amount of heat generated. Therefore, without carbon brushes, it is less likely to break down from overheating. 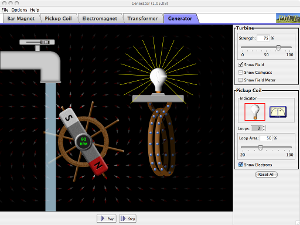 To help you understand how a fixed coil generator work better, you can play with the applet on the left. After opening the applet, make sure you are at the "Generator" tab. Simply move the slider on the tap to the right to allow the water running. You should be able to observe that once the magnet rotates, the bulb starts to blink, which is much like bicycle dynamo. This actually shows that the e.m.f induced here is an a.c.